I 1984 lokaliserede Ivar Gjørup Gud i det enkelte menneske. Tegneserien Egolands ene centrale figur — Gud i menneskets billede, Divus Madsen — ankom til virkelighedens galeanstalt og blev prompte indlagt for storhedsvanvid. Under sin første samtale med Overlægen, blev han spurgt ”Hvad får Dem til at tro De er Gud?”, til hvilket han naturligt svarede ”Hvad får Dem til at tro De er overlæge?” Her lå stribens eksistensgrundlag, i selve den menneskelige erkendelse og den ramme af betydning, vi skaber ved at tro. Metabunkeren er kommet i besiddelse af en intern email, i hvilken Lindhardt & Ringhofs øverste chef Anette Wad oplyser, at Carlsens forlagschef Jens Trasborg har opsagt sin stilling, og at Trasborg som følge af opsigelsen har sidste arbejdsdag i dag, d. 26. maj. I meddelelsen oplyses det endvidere, at Trasborg fremover skal være ansvarlig for forlaget Modtryks børnebøger, og at han i øvrigt tager de to Carlsen-redaktører Heidi Brun og Jonas Holm Hansen med sig. Som Metabunkerens læsere måske erindrer, resulterede Egmonts opkøb af Bonniers forlagsdivision for et par år siden i en langvarig og opslidende undersøgelse af monopolforholdene, som endte med at EU-kommissionen beordrede Egmont til at frasælge Carlsens tegneserieudgivelser (dog med manga som en dybt mærkværdig undtagelse, siden Egmont som bekendt netop har monopol på japanske tegneserier i Danmark), hvilket resulterede i forlaget Cobolt, der med Kurt Damgaard og Carsten Søndergaard ved roret viderefører Carlsens tegneserieudgivelser, mens Carlsen-redaktør Johnnie McCoy simultant (og prisværdigt) har opstartet en ny tegneserieproduktion i Carlsen-regi. Metabunkeren er ikke nærmere informeret om Trasborg & co’s bevæggrunde, men vi holder os ikke for gode til at videregive vedholdende rygter om at Egmonts opkøb af Bonnier har været en særdeles frustrerende proces for Carlsen. Her i Bunkeren ønsker vi Trasborg, Brun og Holm Hansen tillykke med de nye udfordringer, som vi glæder os til at høre mere om, ligesom vi sender de bedste ønsker til Carlsens tilbageblivende stab. Vi håber kun at Carlsen kommer ordentligt på fode igen. Whew. The last three weeks have been pretty busy, and while work’s not letting up for at least another few weeks, I’m allowing myself a bit of a breather here. 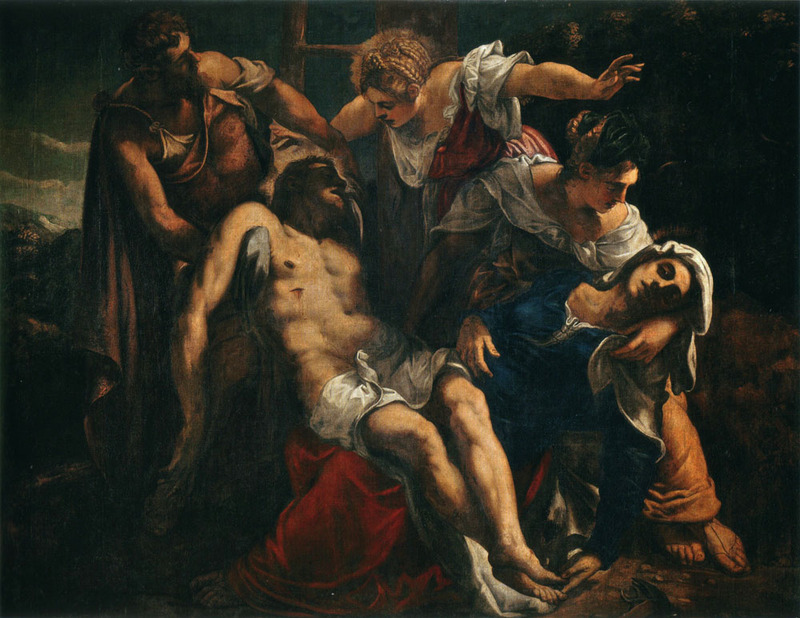 And what better way to do that than by not changing tack at all and just writing some more about Venetian Renaissance art? The Atlantic. Inspired in part by the release of Eminem’s new album Relapse, three critics, Hua Hsu, Alyssa Rosenberg, and Gautham Nagesh discuss the state of hip hop music in this roundtable discussion, focusing on its cultural and political “relevance.” Problematic assumptions, but also a number of interesting points, are made about the onus placed on hip hop to have these qualities, while I think the fact that the music is suffering artistically more than anything else gets ignored. Still, worth reading, as is this smart review of Relapse in Norwegian Morgenbladet. 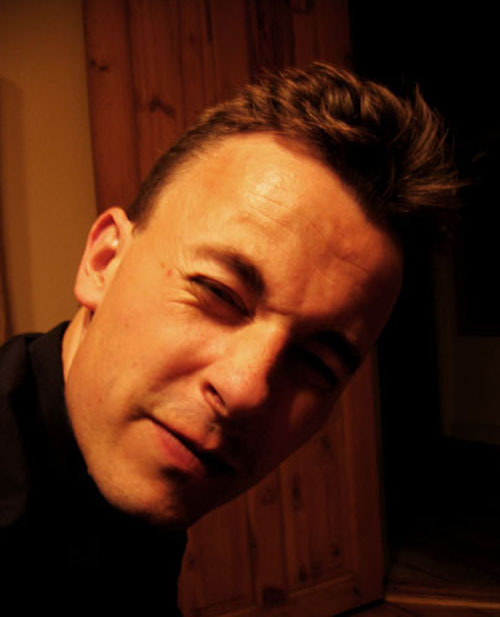 Something entirely different, and old, but in many ways indirectly relevant is this 2005 interview with Doseone from The Believer, in which the MC presents a different perspective on the art form. Unearthed further to the recent news that Dose will be collaborating with Alan Moore on a multi-media project next year. du9. 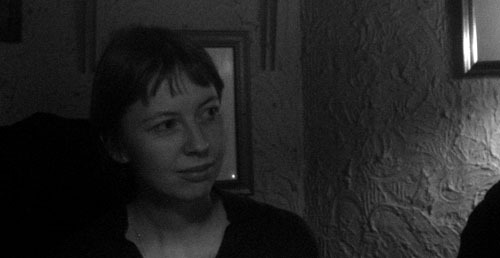 Interview with JC Menu. Extensive quality interview with the co-founder and current sole publisher at seminal French comics publishing house l’Association, in which the publisher’s role and policy in the current French comics market, and in the broader comics culture, are discussed in detail. “Cartoon Conservatism.” This interview with journalist, historian and Ph. 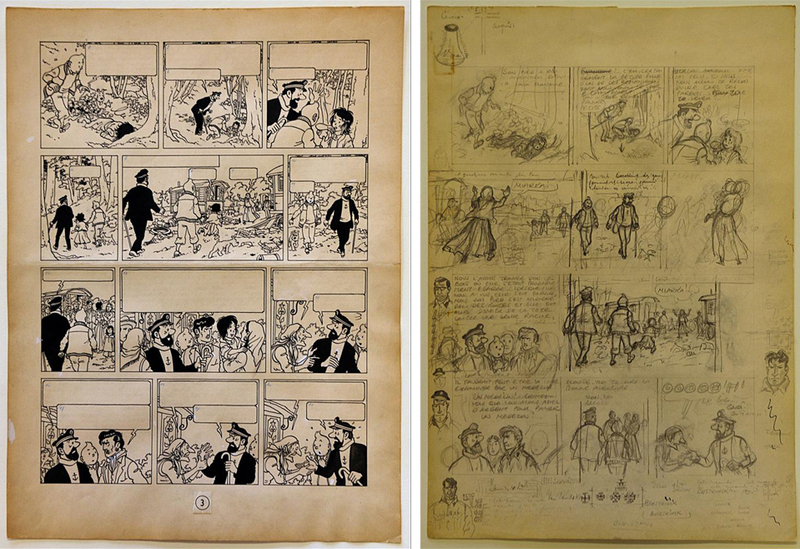 D. student Jeet Heer on his current research on Harold Gray’s Little Orphan Annie and the development of his conservative ideology is fascinating reading and an interesting part of a broader integration of comics and cartooning into cultural studies these years. The recently released book on Superman creator Joe Shuster’s fetish art, edited by Craig Yoe, presents another interesting forgotten story about cartooning as a cultural phenomenon that has waited long to be told. OK, so for about five minutes it sounded like the great Mike Patton was going to collaborate with Alan Moore for the musical part of the apparently autobiographically derived multi-media project, Unearthing, on which the Northhampton scribe has been working with photographer Mitch Jenkins (more here) and others for a couple of years. It turned out to be a rumour though, but for the three of us who care, there’s a bit of equally exciting news in the announcement of the project’s release through the quality British independent label Lex Records next year — MC Doseone is part of the project! 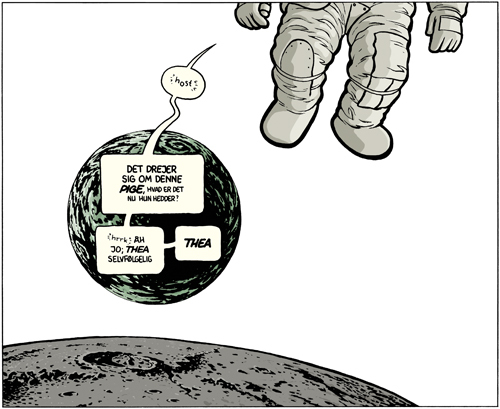 Rosinante har netop søsat en ambitiøs tegneserielinie, med speciale i graphic novels, på det danske marked. De to første udgivelser er danske Thomas Thorhauges Kom hjem og engelske Posy Simmonds’ Gemma Bovery. Med denne satsning på dette særlige tegneserieformat, er Rosinante det første danske mainstreamforlag der følger i sporet efter amerikanske bogforlag som Pantheon og Houghton Mifflin og franske som Le Seuil, Gallimard og Hachette, der alle med succes har publiceret tegneserier de sidste 5-10 års tid og dermed har været med til at styrke det iøjnefaldende fænomen tegneserien efterhånden er blevet på det internationale bogmarked. GQ: “And He Shall Be Judged”. A fascinatingly horrifying article by Robert Draper on Donald Rumsfeld and his disastrous time as Defense Secretary, sourced from a large number of Bush government insiders. Try and read it without wincing. Southern Mothers: “Olafur Eliasson (A Milli Remix)”. This is old, back from when those waterfalls were installed around the Southern tip of Manhattan. Kind of a pity that it is not bona fide old school hip hopper Eliasson himself rapping here, but these guys are actually pretty funny. Consider this a much belated supplement to my linkage to “A Milli” dubplates from last year. 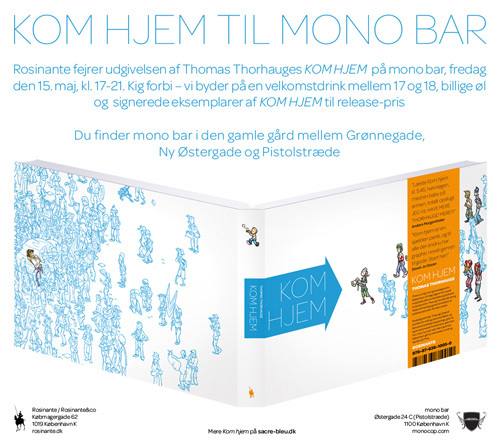 Check the hype her og drop endelig forbi Mono Bar, hvor festen allerede er i gang. OK, so there isn’t much happening here, I know. I have a couple things brewing, but have simply been too busy on dissertation work to do much in here. Hopefully I’ll be able to post a few juicy things over the next weeks though. 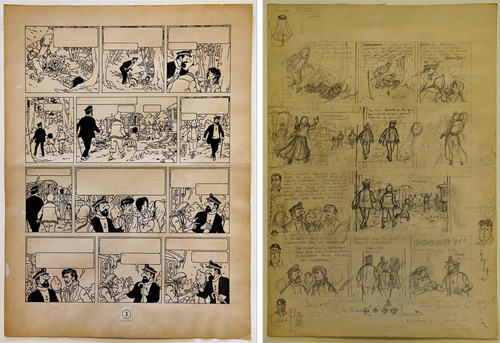 In the meantime, here’s an awesome set of preparatory Tintin pages — full inks, and a page of sketches — from Hergé’s swan song, The Castafiore Emralds (1961-63). These were just sold for some astronomical sum at an auction in Namur, held on the occasion of a small festival celebrating Hergé. Check out how Hergé plays with the sequence on the sketch page, trying to find the right arrangement, repeating certain scenes and sticking others in, out of chronology, while still maintaining the overall integrity of the page as a unit in his narrative. By this point he had surely worked out what needed to be accomplished on each page in the album, but still needed to fine-tune the breakdown and arrangement of panels. It’s interesting to see that he ended up playing down the emotional scene of the Roma child being reunited with his mother — a scene he seems to have agonised over before deciding to leave it out. The portrayal of the Roma in the story is a little on the romantic side as is, and here Hergé gives us a live act of walking the tightrope of sentimentality. I dig the marginal character sketches too! A few more original pages, amongst them a fairly finished sketch for The Calculus Affair, were sold at the auction, check them out here. 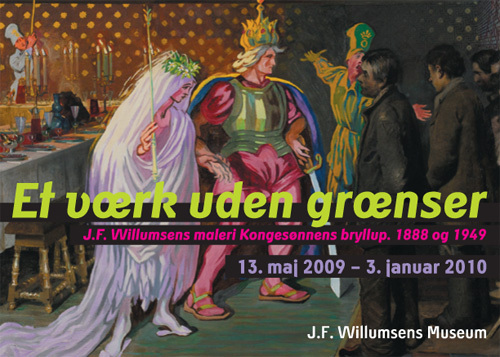 Seriejournalen provided the tip. Frank Rich: “The American Press on Suicide Watch”. Rich cuts to the chase in this piece on what seems increasingly to be imminent demise of print journalism. Steven M. Johnson. This blog entry by Allison Arieff brought my attention to the deliciously ludicrous and quirkily inventive work of this cartoonist/inventor/author/urban planner. Check it out! The Walrus: “Back in Palookaville” Sean Rogers writes about the role of design in the current revival of comic strip history and features the consummate if problematic work of Seth. Interesting perspectives are sketched out. Supplement it with this nice multimedia presentation from Seth’s home. The best comics of 2008 according to the Metabunker.